This year we introduced a new fly-in layout. 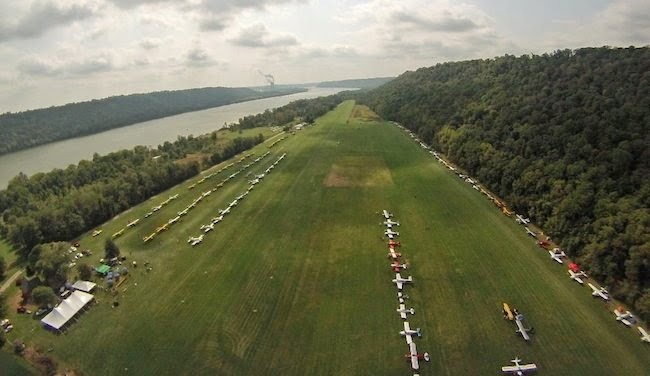 Since the beginning of Lee Bottom time, all events have been focused around the home and hangar situated mid-field. That's no longer the case. Many years ago I realized the layout of the airport meant a north end focused event would run more smoothly. Yet, as it goes with so many other things, when people found out about this CHANGE, they kind of went a little mid-field kooky. It's funny what people get attached to. People did not like the idea. Even Ginger questioned my sanity. It just didn't seem do-able to her without all the structures at mid-field to use as support and storage. Yet, it turns out there were a few positives generated by the storm several years back. Because of the tornado, we took a break. This meant people were not regularly visiting the home and hangar area. And due to the structures being damaged, their usefulness was depreciated. Therefore, when it came time for me to tell everyone it was all going to be at the north end this year, they shrugged their shoulders and accepted it. So how did it work? It worked great. Because of planes being parked on both sides, a north end pedestrian cross walk placed everyone as close as possible to fly-in center. Furthermore, food was no longer a mile walk or two tram rides for the southern most attendees on the west side of the runway. The store was there, food was there, registration was there, and I guess I could say pretty much everything was there. Attendees could hang out at the big-top and when they felt like it they could go either direction without a huge walk. As for the drive in attendees, there was a shuttle to take them to show center. It just made sense and it made everything easier. Of course everything has a trade off. The only thing potential negative we could find was that in years where wind favors landing to the north, people at the north end wouldn't be able to see all the planes arriving as easily as they had in the past. To compensate for this, we had a viewing area set aside by the hangar just in case that were to happen. For the most part though, we landed south so this time it went unused. In the future though, it would still be there for those who wanted to judge landings or take photos. Thanks to all of you who took time to specifically tell us how much you like the new layout. Your input reaffirmed what we were already feeling; it was a new beginning and we were off to a good start. Worth It's Weight in Gold?